I bought an Obihai OBI202 VOIP box in November 2013 for my home office; these are $70 from Amazon and elsewhere and often on sale for less (I paid $52.24 shipped). The Obi202 is another great VOIP box, even better than Ooma IMHO, but for more technical users. For the first year, it provided an absolutely free phone line via Google Voice. This year (May 2014), Google dropped its support for free outgoing calls, so I signed up for a year of service for $60 with PhonePower. So far the service has been perfect. dd-wrt is open-source linux-based firmware that can replace the stock firmware on many wireless routers and it is awesome. dd-wrt maintains a database of routers they support; if you are technically inclined and your router supports it, I highly recommend trying dd-wrt; note that you almost certainly void your router warranty by replacing its firmware. In mid-May 2014, I purchased a Foscam FI8910W wireless IP camera to replace my ancient X-10 analog video camera and my experience with it is described below. Overall, I’m very happy with the camera; it’s a great value. Excellent feature set: pan/tilt, VGA resolution, awesome IR night vision, 2-way audio, motion detection, automatic uploads/emails, decent mounting bracket, long PS cable, etc. Low cost: I bought it for $55 on eBay from Adorama Camera. The IR night-vision works beautifully; images are clear as day. This snapshot from my front porch was taken at night; the porch lights are off and it’s pitch black to the naked eye, but clear as day with the IR camera (sans color of course). 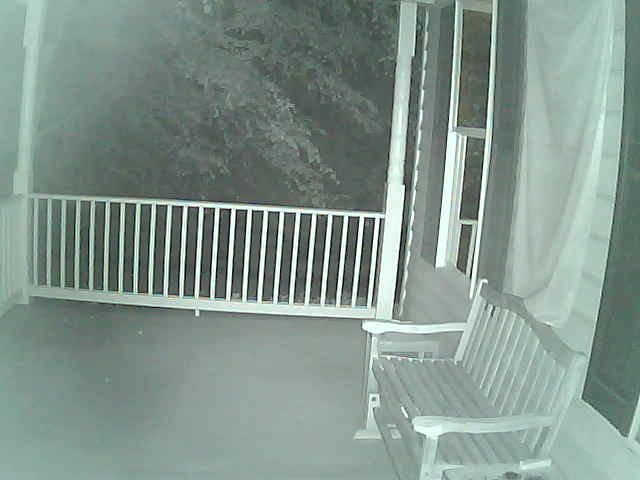 This one shows the front porch (looking the other way thanks to the camera’s pan/tilt) so you can see how far the IR lighting reaches: you can see the pine tree at the edge of the property…notice how the American flag hanging above the bench has no color in IR. 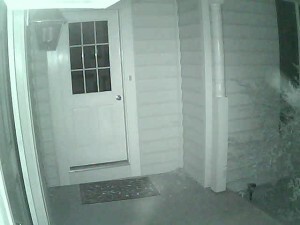 Again, the front porch is pitch black to the naked eye. Once logged in, you can ask the camera to display its complete configuration information which sends all users/passwords in plaintext! The web interface is optimized for IE. The Firefox interface is adequate but a little kludgey (especially the audio). There is a known defect in the DSP image processor in some units that causes the video to drop and the camera reboots when pointed at an image with lots of fine detail. It took me a while to figure this out; it worked fine until I pointed at my front yard in daytime where the fine grass, leaves, etc. caused constant reboots. I sent the camera to Foscam for RMA service, they provided a free shipping label by email and within a few days I had a new camera that works perfectly. I initially attributed the DSP problem to an inadequate WiFi link because the camera worked beautifully indoors on wired Ethernet or on WiFi. 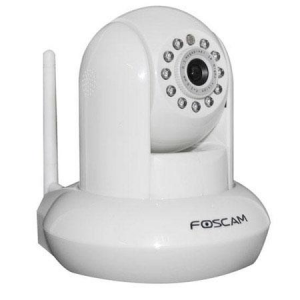 Foscam makes the camera with a standard SMA connector (I didn’t think this was allowed anymore under FCC regs) and the stock camera comes with a stubby (claimed 3dBi) antenna. So I bought their add-on 9dBi dipole antenna ($8 on Amazon) that is 12″ long plus another ~2″ for the base! Naturally it didn’t fix the DSP problem and the stock 3dBi antenna works just fine, giving me a very good signal through several walls. However, the 9dBi antenna is very nice and well worth $8 if you need more range. Update 8/24/2014: I just bought another…the best endorsement.